On a warm evening in June 1989, marathon buzz revved up in the back room of O’Sullivan’s Public House in Forest Park. Brian Piper (aka “Pipes”), a CARA Board member since 1987, had organized a meeting to discuss training for a marathon. Bill Fitzgerald, ready to step up to marathon training, had seen Pipes’s announcement and attended that evening curious about the plan and hopeful to log his long runs with fellow runners. Fitzgerald, along with 15 to 20 other interested runners, listened to Piper outline the training program while they shared a few rounds of cold beers. The 18-milers on the schedule sounded a bit daunting to Fitzgerald. Looking back 25 years ago, marathoners were an elite group of young, super fit guys who ran the 26.2 miles under four hours. “The sport was less inclusive than it is today,” says Fitzgerald. “Most runners didn’t think of coming to a marathon until they had years and years of miles under their belt.” Training was high mileage and if you didn’t get to the finish line in 4 hours, there was a good chance the finish line wouldn’t be there, as it would’ve been dismantled by then. Piper came to the table with hundreds of miles on his shoes, struggling with his first marathon and taking several tries to qualify for the Boston Marathon. He knew there had to be a better way to train so he studied other training programs, including that of the St. Louis Track Club. He modeled his program after the club’s step back idea: the principle of progression and then rest, or three hard running weeks followed by one easy week for recovery. Piper revealed his 18-week schedule to the group and if you couldn’t keep up, well, you might as well just stay in bed. An eager, athletic group of 35 runners joined Piper and Fitzgerald in CARA’s inaugural marathon training program, meeting every Sunday morning starting at the CARA Bulletin Board at Diversey and the Lakefront Trail. They trained with the goal to run the Chicago Marathon later that year in October. After the second year of the program, Hal Higdon was invited to speak to the group at their banquet. He befriended Piper and they worked together on modifying the marathon training program, tweaking the mileage for detailed day to day runs including 3 weeks of taper. Midweek meetings included how-to clinics and long runs continued on the weekends. “The main attraction of the CARA class wasn’t merely the training program. What made it work was Brian’s dedication, along with Bill Fitzgerald and Tom Moran who set up the program of volunteers at each location. They are the core of the program and camaraderie that makes it all hum,” says Higdon. The program gained popularity quickly. By the third year, Fitzgerald approached Carey Pinkowski, race director for the Chicago Marathon, about giving the CARA group a “piece of real estate” in Grant Park at the end of the marathon to set up a small tent for the CARA runners to congregate after the race. Pinkowski let them set up their no-frills tent, which happened to draw other inquisitive race finishers to the area. The stage was set. Runners loved the idea, spurring them to join CARA’s program. Training meeting locations doubled with one at Diversey and then Waveland by the Clock Tower Building. It seemed each year the groups outgrew their established meeting sites. The growth of marathon training in the 1990s took off with the formation of charity running, notes Wendy Jaehn, executive director of CARA. People wanted to contribute to charities and snag a bib number. 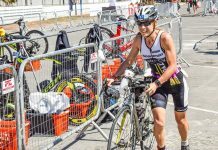 Awareness and popularity spiked the numbers of people looking for a structured, formal marathon training program and CARA was there ready to deliver. By 1997 the training group had blossomed into about 750 runners training in eight different locations around the city following Higdon’s Marathon: The Ultimate Training and Racing Guideas its textbook. CARA set the stage for many firsts in training, says Fitzgerald, who has either run or volunteered at the past 25 Chicago Marathons, from bringing water and sports drinks on the course to dining on breakfast after group runs. It was just a matter of time before CARA began offering various levels of training programs, supporting runners on the course, putting on clinics and organizing pacers. Establishing pacers on race day motivated runners to join the class, says Higdon, who had approached Pinkowski about allowing pacers in the Chicago Marathon. Not long ago Chicago runners asked for more to keep them motivated, so CARA responded and in 2009 began winter marathon training. Despite harrowing winter weather in the Midwest, runners continually have a group to keep them accountable. 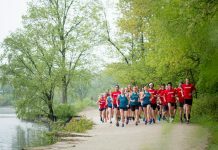 Now, CARA has 10 summer training locations coaching 2,500 runners, their largest group ever last year. In 2012 CARA added two new sites, one in Busse Woods in Schaumburg and the other in Hyde Park in Chicago. Like all good things that age, the curriculum evolved in time. Jaehn says recent enhancements include online training components, an updated advanced program with higher mileage, and free speed training three times a week for all fitness levels. CARA plans to celebrate its mile marker of 25 years of marathon training by announcing giveaways, which may include shoes and packages from sponsors, on the 25th of every month on their Facebook page. Jaehn says they are in the process of finalizing a special 25th year logo. A big celebration reception is scheduled at the end of the season on Nov. 16 on the 99th floor of the Willis Tower. Past and present members will listen to keynote speakers and commemorate 35 years of the incorporation of CARA along with 25 years of marathon training. “This is a place to celebrate running and all who have been involved,” says Jaehn. Summer training starts June 15 and ends October 5, with the last week of the 18-week program being the Chicago Marathon. 80 plus charity programs affiliated with CARA’s marathon program. 30,000 plus runners have completed CARA’s marathon training program. 250 group leaders for multiple pacing groups per location. 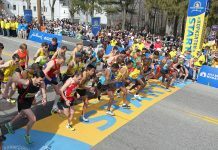 Pacers lead groups every 30 seconds, from 7-minute per mile pace to a 12-minute per mile run/walk. 18,000 estimated miles logged over 25 years (an average of 40 miles per week for the 18-week summer program).